Old renovated farmhouse that is also my second home so this house is not just another rental farmhouse. 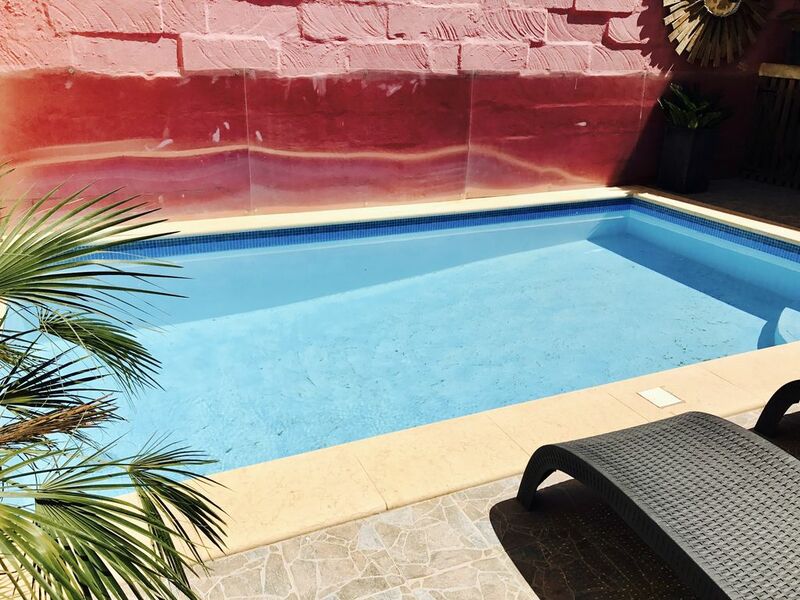 It’s located on Gozo (small island off Malta) near Xaghra main square (less than 10min walk away) and has a private sunny 19 x 11 foot pool, outdoor lighting, 6 sun loungers, table + chairs and an outdoor gas BBQ. On the 1st floor is a private sunny terrace + a sun sail ideal for al fresco dining as well as a couch area for chillaxing with a glass of wine. There is outdoor lighting creating a nice ambience at night. There are 3 bedrooms all + air conditioning and 2 are en suite with also a bathroom downstairs for the 3 rd bedroom. The house has plenty of authentic old features set in a boutique style inspired homely interior. It is near the famous sandy Ramla beach and is a very short walking distance from all amenities and the quaint Xaghra village square with plenty of restaurants and bars. Wifi is available and the washing machine is available on request only for for longer lets. I am a freelance fashion stylist originally from Belgium but now living and working in Dublin, Ireland. I fell in love with Gozo - and in particular Xaghra - about 10 years ago. I love the peacefulness and the surrounding of the sea. There are also plenty of restaurants, bars and clubs if you need some action! I think that Xaghra is one of the nicest villages on Gozo with the nicest square that has plenty of restaurants and bars just a stroll away from the house. Equally, the house offers tranquility enabling guests to relax in very comfortable surroundings as well as relax beside or in the lovely private gorgeous pool. En-suite bathroom to bedroom 1 with shower and toilet. En-suite bathroom to bedroom 2 with shower and toilet. Separate bathroom to bedroom 3 with shower and toilet. There is a cloth line in the upstairs bedroom balcony. A large living room with an large comfortable L shape couch and cushions, large flat screen TV, cable, DVD, cable attached to speaker for ipod, ipad or android phones. Also contains a dining area with an expandable table suitable for up to 6 people. Golf courses are available on Malta, the main island. Notes on accommodation: Bedroom 1 and 2 are air-conditioned. Cot and high chair available on request. Outside: Large private (19 x 11 ft) swimming pool with modern and comfortable outside furniture. On the first floor is an outside terrace for alfresco dining. A roof terrace with sea views with all day sunshine for real sun seekers. Utility Room: Outside utility room with washing/machine dryer which is available on request only and available for a minimum of a 2 week rental only. Cleaning / Towels / Linen / Maid service: Towels and linen are provided. A clean house is provided on arrival and will be cleaned again on the check out date. Any additional cleaning or changing of sheets/linen can be organised and settled directly with the housekeeper for an extra Other: Large outside terrace on first floor suitable for outside dining with a large dining table and chairs covered with an umbrella as well as a seating area with a cushion outdoor couch and matching comfy large cushions. Beautiful property, lovely location. A luxurious home from home. We recently spent a week at Sonja's gorgeous house. So comfortable, we hardly wanted to go out! Our teenage son particularly appreciated being able to have his own space - afforded by the sheer number of rooms and outdoor areas. Oh, and WiFi of course! Pool area perfect for relaxing - always a mixture of sun and shade to suit, and the pool itself was clean and the perfect temperature. Bedrooms lovely - air conditioning a very welcome essential - with en suite shower rooms fully equipped with toiletries. The village square is a ten minute walk away, with several great restaurants to try. Lots of delicious fish and seafood. And you can pretty much get anywhere on Gozo in 5-10 minutes by car! A perfect spot for relaxing and recharging the batteries. Thank you. Just got back from a wonderful 7 night stay at Sonja's beautiful home in Xaghra, Gozo. What a great choice we made! Her place is a stylish and comfortable converted farmhouse, a little like an upmarket boutique hotel but with the touches that actually make it a home which most obviously it is. When we opened the front door and went in we were hit with the wow factor and after exploring the house further felt immediately at home and took no time to feel totally relaxed. It has some great areas in which to chill out like the pool area and the upstairs terrace that sits just outside the bedrooms. We were out exploring beautiful Gozo most of the time but when back at home we really enjoyed making use of these areas and took a dip in the pool everyday. The living room too was nice and comfortable just to relax in sometimes when inside. The kitchen was great although we only used it for breakfast mostly as we ate out a lot, but it was very well equipped and I imagine you could make some really nice meals in it. It has a breakfast bar type island in the centre which we liked to sit around in the mornings discussing our plans for the day. The location was pretty much perfect for us too. The island is small and easily navigated in no time at all really. We had a car for the week but there is a great bus service provided and there is a stop just a stones throw from the house. Taxis are also plentiful and cheap. The main thing with the location though was it's proximity to Xaghra's village square, only about a 5 minute stroll away. We made use of the fantastic little restaurants that are there most evenings and were most lucky to visit the week before their annual festival. There was always something going on in the square and everyone was so happy and friendly. Sonja was great too even though we never met was a fantastic host and was extremely helpful - she was absolutely brilliant with any correspondence and pretty much replied to any emails in no time at all. All in all it made for an absolutely wonderful holiday and I couldn't recommend it highly enough. Do yourself a favour, stop searching and book now! We loved Gozo and Sonja's home and promise we will be back soon! PS I could have carried on with this review and gushed about the home and holiday a lot longer but have ran out of available characters!!!! This amazing revamped old farmhouse, at walking distance of the centre of Xaghra, might go unnoticed at first sight. But when entering the house ... private pool with a terrace, a terrace on the roof and a terrace on the 1st floor! The character of the house is combined with contemporary touches of interior design. Plenty of space for unwinding, wining & dining. Very suitable for a relaxed holiday. And if you want to go for some trips (like Ramla Bay, Xlendi, Victoria, Marsalforn, ...): the house is near bus stops or a hired car brings you anywhere on the island within 10 to 20 minutes. And Xaghra's cosy little centre, with restaurants, bars, ... A perfect holiday hideway. Had a super time with my family enjoying the pool and relaxing reading my book on the terrace with a glass of wine. We didn't always feel like cooking dinner and the picturesque Xaghra square which has plenty of restaurants and bars is only a 5/10 min walk away. Would love to come back staying 2 weeks instead of 1! I am thrilled you had a super time and thank you for staying at my home. Perfect getaway at anytime of the year. This house is a hidden gem, having never been to Gozo before I was curious to see what it had to offer and I wasn’t disappointed. The accommodation is wonderful, a modern take but compliments the traditional Maltase look the owners have a great eye. The rooms are very spacious, Wifi and the house has its own private pool. I was there in mid June of last year so got a feel for the place in the sun which was fantastic but returned earlier this year when the temperature was still very pleasant and even though it would have been off season there was still plenty to do, place to explore. A 2 minute drive from the renowned sandy Ramla beach which is great for sunbathing as well as for snorkeling, surfing and any other water activities. Its recommended to pre-book a taxi for your pick up from the airport to go to the ferry and brought to the house. Alternatively, take the shuttle bus and walk to the ferry and use a taxi by your arrival in Mgarr (Gozo) harbour. 2 minute walk from a local shop for all your essentials and a 5 min walk from Xaghra main square which has a great restaurant and bar called Dvenue as well as coffeeshops and a pub. 10 minute drive from the capital Victoria where is the citadel and plenty of shops and market stalls. A list of recommended restaurants and bars is available in the house. Booking Notes: 50% deposit of the rental fee to make the reservation and the remaining balance due 8 weeks prior to arrival. Cancellation policy: a cancellation can not be made later than 3 months prior to the reserved booking date. In case of a cancellation, deposit will only be refunded if house is rebooked again. Changeover Day: Normal changeover day is Saturday but we are flexible in off peak seasons and always check with the owner. Departures shouldn't be later than 12.00pm and arrivals at around 4pm but changes can be made with the owner.